The SUMMA consortium is organising its second user group meeting to show the progress made in the SUMMA media monitoring platform since the first user day held about six months ago. This workshop will demonstrate our media monitoring platform and present some of the challenges to monitor news efficiently cross-lingually and solutions provided by the underlying technologies. 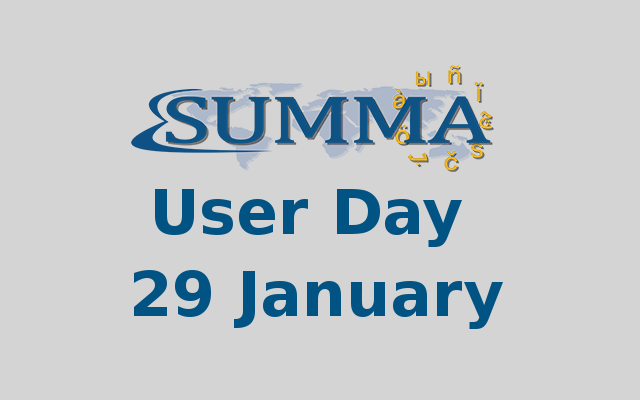 The objective of the user day is to engage with people from industry who might be interested in SUMMA technologies and gather feedback from potential future users. We welcome both new attendees and those who participated last year, to show and discuss new developments and progress and potential for use of the platform. The event includes presentations, demonstrations, technical poster sessions and a panel discussion. Stay tuned for more details on the programme of the user day. LASEDE – Event Space, 63 Calle de Hortaleza, 28004 Madrid, Spain, on 29 January 2018.
contact info@summa-project.eu for more details and registration application.